While we wait for the Tropical Storm to pass, we have a rainy windy day, here in southwest Florida. I thought I'd put up a blog from awhile ago, of a beach scene begun with an alcohol wash. I started with a photo from a hot day at Boca Grand beach, but decided to make it less elongated, with more of the beach. 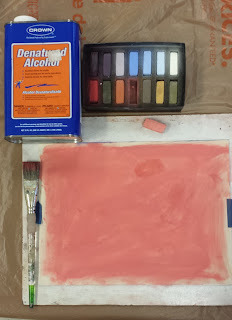 Here I have covered the painting with the colors I am using for this heated afternoon. The water is very turquoise, the sky almost pink with the humid haze. 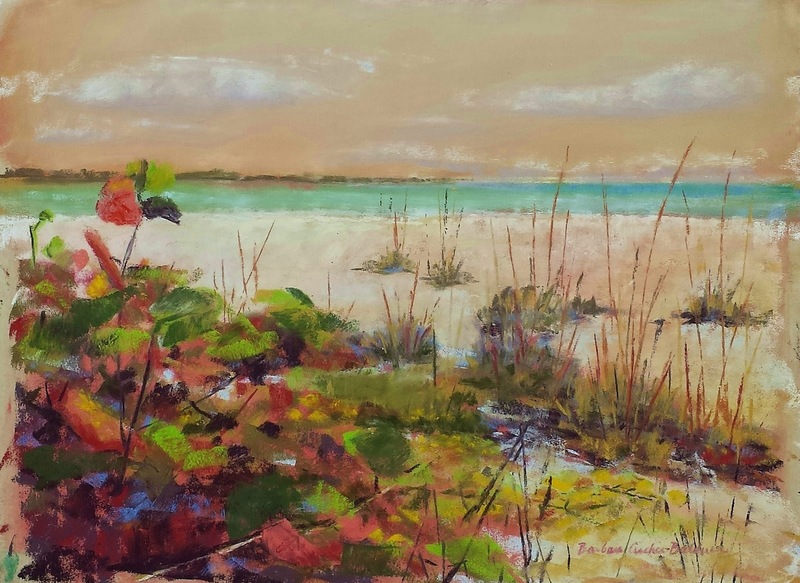 I have also blocked in some of the sea grapes that grow on the sand, and a few clumps of sea oats, to round out the composition. 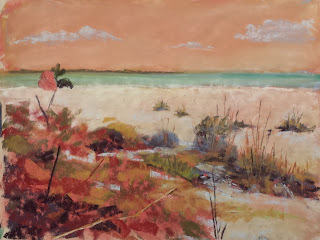 I am working on the sea grapes, with some dark purple and light oranges and reds, still mostly hot colors, showing stems and leaves., I don't want to have too much detail in the finished painting. I have established the sizes of sea oat clumps, added shadows under them with a dusky blue,and added a little strip of land on the horizon, This is a channel between two islands. The sand was white hot!. 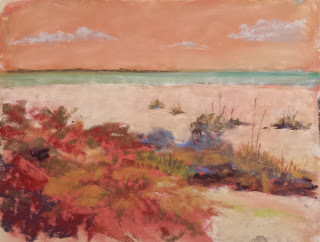 "Hot Noon at Boca Grande Beach" ,8" x 10"
that is a beautiful painting, and also a really nice set of TLs!